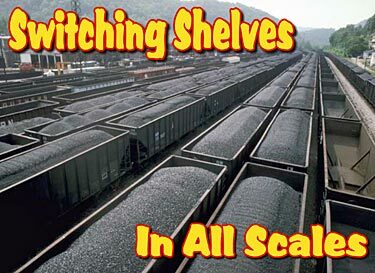 7/8-Inch Scale: Large Scale Shelf—Seriously BIIIIG trains! these examples drawn from all the popular scales in current use. 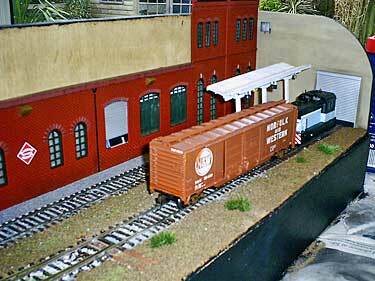 Tiny Z scale is not usually considered a “switching” scale… but that’s not necessarily true. Here’s a very small shelf, designed to fit in the palm of the hand, by Frédéric Gantier, from Rennes, France. 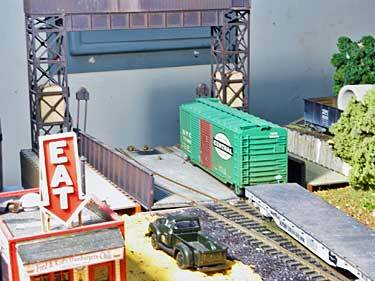 Buildings are scratch-built from Pola kits, tracks and loco come from Märklin, and the boxcar is kitbashed from a Galoob Micro Machines item. The layout measures 14.5x9x3.5cm (5.7×3.5×1.4in). It is packed in a mini plastic box and put in the pocket for transport. 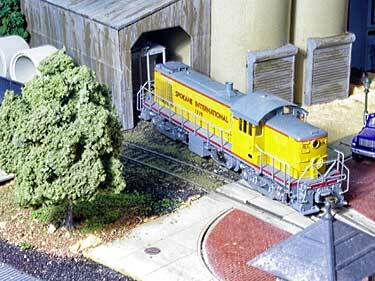 Z SCALE (1:220, 6.5mm gauge): SWITCHING? IN Z-SCALE? OBSERVE! Still not convinced that reliable switching is possible in Z scale? Here’s impressive proof (right) from Frank Bergmans, who lives in Dommelen, the Netherlands. His work-in-progress (above) is a Tymesaver-style Z layout measuring 95x25cm (37x10in). 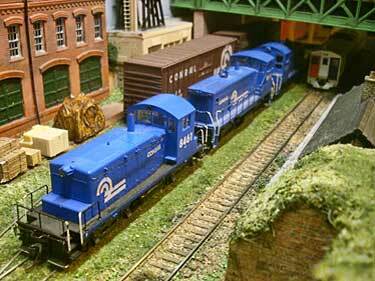 Frank uses GP locos from MTL, which he believes are the smoothest switchers available. For more, see his website. Ruthton North, a 52x12in (132x30cm) passenger terminal set in northwest England c. 1955-65 is adapted from a plan by Paul Lunn (redrawn above left). David Richardson’s version (left and below) features a long platform for mainline trains and two short railmotor platforms for commuter traffic. A goods (freight) siding serves a mill, bringing in fuel and exporting finished goods. 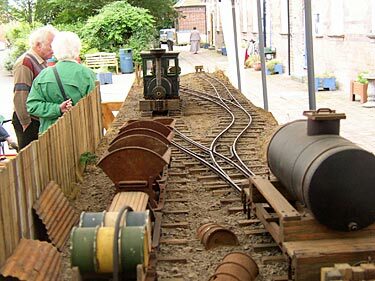 The fiddle yard (representing the “rest of the world”) fits behind the long mill buildings. David lives near Swindon in Wiltshire, England. 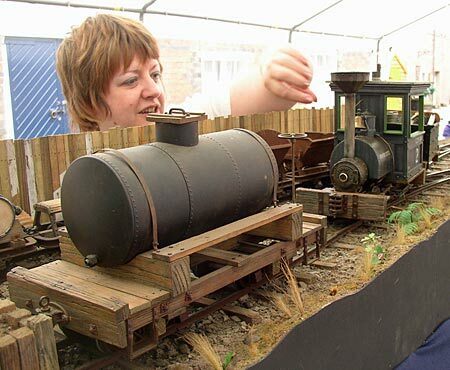 Kidmore Gumstump, an excellent N scale version of the classic Gum Stump & Snowshoe Railroad, was built by David Mitchell, from Reading, England. David added a few flourishes to the original plan, increasing the number of sidings in the lower yard (at right) and adding a useful runaround loop (passing siding). 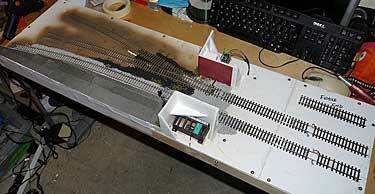 The rest of the layout, with its familiar overlapped switchback design, fits neatly into a 4x1ft (120x30cm) shelf. For more information and photographs, see David’s website. Sharing his 48x15in (120x38cm) layout under construction is Eldon Hoolsema, aged 15 from Jenison, Michigan, USA. Eldon has been model railroading for several years now, but Smokey Hollow Railroad is his first narrow-gauge line and first micro layout. 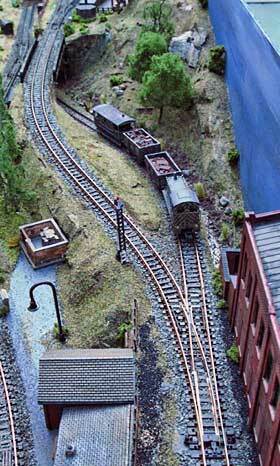 It illustrates well how much railroading you can do in just a small space, using narrow gauge! 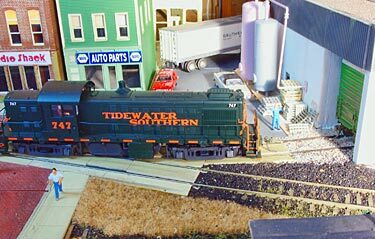 Eldon’s scratchbuilt box cab loco (using a Kato Pocket Line chassis) handles the traffic between the Smokey Hollow Charcoal Co. (being built to fit in the white space at the top center) and the interchange with the main line (off to the right). Also under construction are four charcoal kilns to fit in the brown space beside the main building. Highlight of the scenery is the Walthers car float bridge, a “must have” for John. He hasn’t built the car float yet, but the bridge is in place (below, right) and cars are added to it or removed manually. 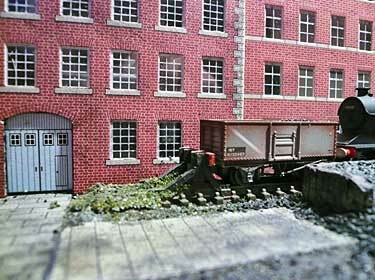 Another good stunt is using the Walthers concrete plant (below, left) as a an industrial backdrop for the layout. 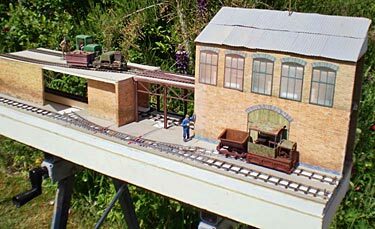 All in all, there’s a lot of operation packed into this tiny area, whether it’s operated on its own or as a switching branch of the large layout that provides its fiddle yard! Steve Grantham, from Bubwith, North Yorkshire UK, reports, “Black Rock, Buffalo is based around a small REA depot and attached team tracks. Looking at an old railway map of Buffalo I located an area that could well have had such a depot and, after looking on Google Earth, I found out the area was called Black Rock… Dimensions are 6ft long including fiddleyard by 7 inches wide (180x18cm). 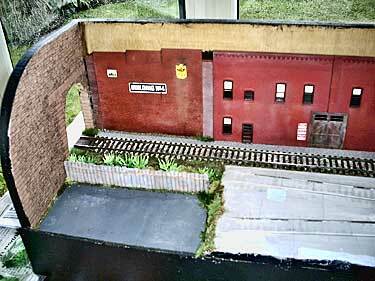 The scenic board was originally an N scale layout acquired from a friend!” The fiddle yard is simply a stub track available for manual addition and removal of cars. Works fine in a low-volume, easy-going switching area like this one. The prolific Bob Hughes, from Sandbach, Cheshire UK, has done it again. 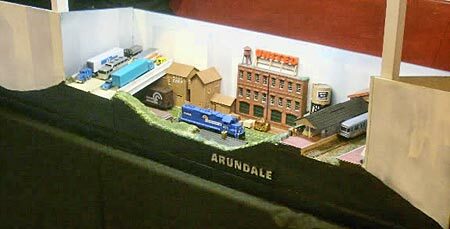 His new HO layout measures 5x1ft (150x30cm) and is called Arundale. 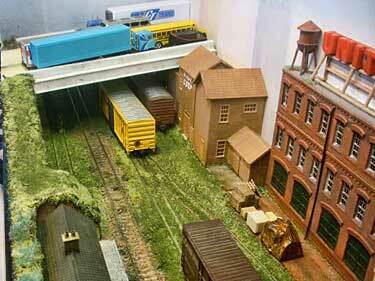 Bob describes it thusly: “It is a small, self contained HO layout set somewhere in Conrail territory. The scenery is urban, which I think gives a much more believable reason for a cramped layout. In this case the action is sandwiched between a pair of overbridges, one with a dummy rapid transit station on it and the other carrying a highway. Sounds like a lot of fun to be had! 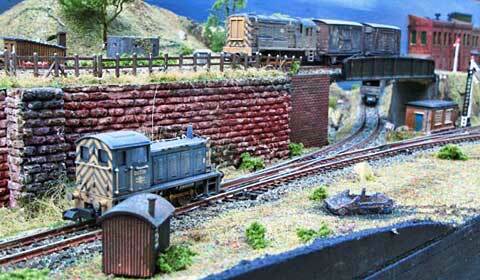 Simon Ward, from York, England, has a photo page (no longer active) of his work-in-progress layout, Temple Lane. 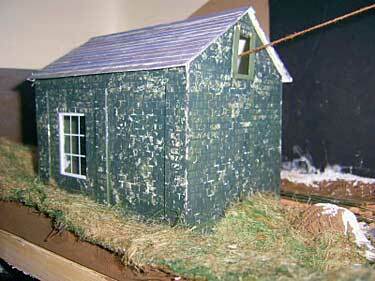 Measuring just 3x1ft (90x30cm) plus fiddle yard, it’s his first micro layout. 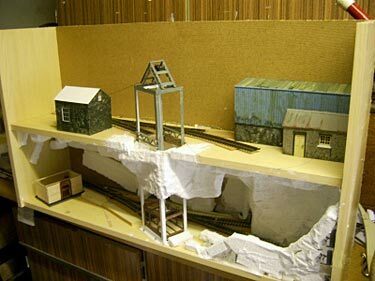 Part of the point is to investigate construction methods, especially using foamcore (foam board), which he says is “very useful stuff indeed!” The layout features nighttime operation and lighting, and is set in the post-privatisation era. 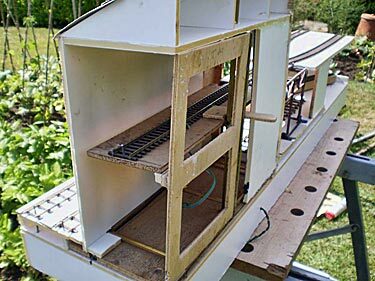 Stu Hilton, from Truro, Cornwall, England, came up with an unusual bi-level switching shelf. 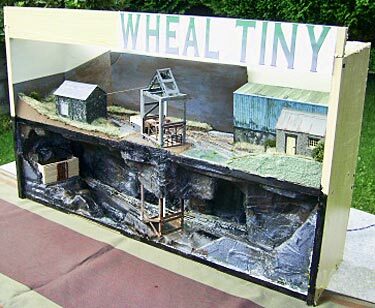 He describes it this way: “Encouraged by Jack Trollope, I created Wheal Tiny, a layout to fit in with the rules of the Wealden Railway Group competition [footprint equal to three sheets of A4 letter paper]. 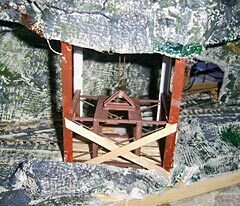 Elsewhere on this site there are two other bi-level mine layouts using a hoist: Klaus Komischke’s Box File Mine and Carl Arendt’s Almagamated Mine #258. 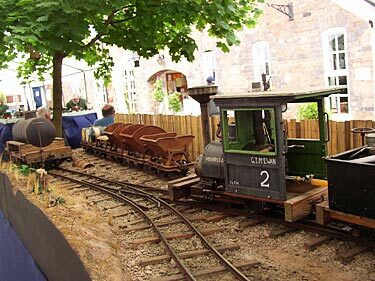 Southwark Park is the terminus of a [fictional] short branch line in South London, England. With its connection to the Brighton mainline the station stayed bouyant from its construction in 1869 until its closure during WW1 and subsequent abandonment upon grouping. It is bordered on three sides by warehouses and tenements, and in the cramped location hosts three platform roads, a loco pocket and signal box/lamp-hut. 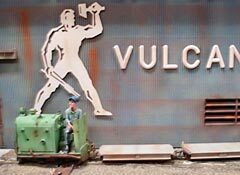 Will Ayerst, from London, designed the model in ScaleSeven (finescale) O gauge. The track plan is based on Carl Arendt’s HO design, Amalgamated Terminal, and in the larger scale measures 15x2ft (4.5×0.6m) distributed over three modules. According to Will, “Each staging and platform road is four feet long to accomodate a large tender locomotive and two bogie passenger carriages, or a smaller tender locomotive and three 26-foot carriages, and so on. 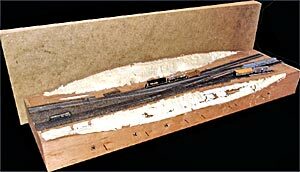 The layout is trisected by a tunnel and a road bridge which should ensure that no full train is viewable in any section at once, thereby hiding the under-scale length of trains hauled by larger locomotives.” Despite the layout’s small size, minimum radius is 6½ feet and minimum turnout size is #6 including a 1:6 double-slip switch. This would be an amazing road featuring finescale modelling of passenger service in an extremely small space. 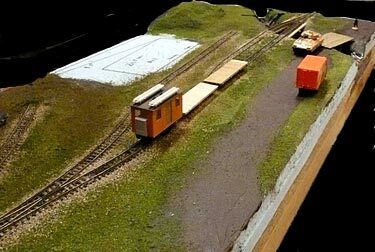 Inspired by Alexander Lehmann’s clever, compacted micro version of the Gum Stump & Snowshoe RR, this tiny layout is under construction in 1:32 scale by Les Coleman, from Maresfield, East Sussex England. 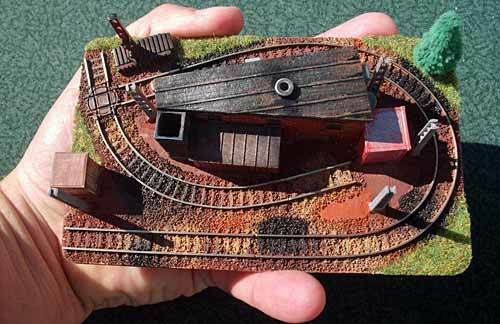 Les started by aiming at the Wealden Railway Group’s 3xA4 layout challenge (described above), but when those plans fell through he was hooked and has continued work on the layout. Les comments, “The building housing the hand-operated two-level traverser is a foamcore mock up which will be replaced shortly. I puzzled for some time about how to hold the vertical traverser in the uppermost position before hitting on the solution. The traverser can turn on the vertical rod as well as move up and down on it. 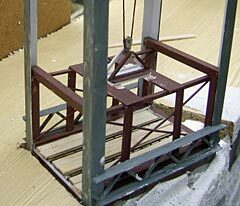 At the top position I swivel the traverser by a few degrees—about half an inch at the ends—and settle it on fixed supports at each end. When I want to lower the traverser, I swivel it back again slightly and lower it using the handle (see lower left photo). “As befits an industrial setting, the track is planned to be inset, which is still unfinished. The stock shown is 1:32 scale, although it can also handle Gn15 trains.” All in all, this is an ingenious micro layout based on a classic small-layout design! 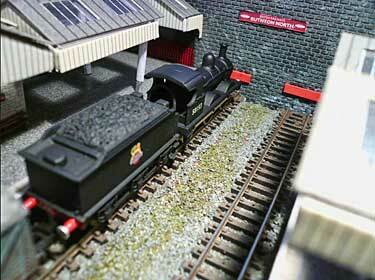 Gn15 SCALE (1:22.5, 16.5mm gauge): CONVERTING FROM O TO LARGE SCALE N.G. 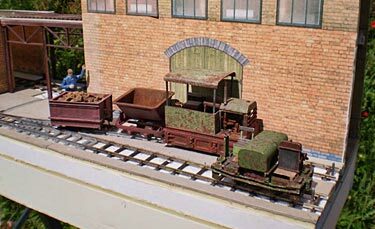 Changing scales on his layout (sometimes called “rubber gauging”) is Franck Combe, from Asniéres-sur-Seine (suburban Paris), France. 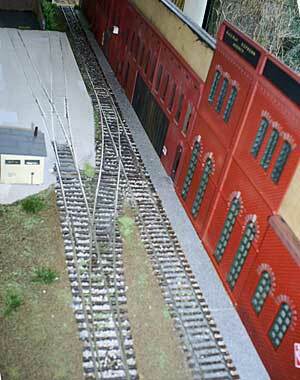 Franck is switching from On30/Oe (at right) to Gn15 scale (1:22.5 or thereabouts) (below). Interestingly, very few changes are required in the track plan, just the scenery. 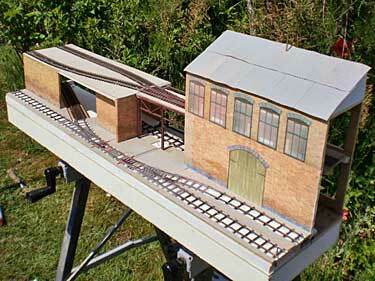 7/8-INCH SCALE (1:13.7, 45mm gauge): THE ULTIMATE MODELERS’ SCALE? Probably the largest of the indoor switching shelf scales is 7/8-inch to the foot, which uses G-scale track (45mm wide) to represent two-foot gauge! These are really BIG trains, built essentially board-by-board, just like the real ones are. A long, narrow shelf is about all that can be accommodated in an average home in this scale! These photos of Simon Harris’s exhibition shelf, which measures about 10×1.4ft (3×0.5m), provide a feeling for the size and heft of these delightful models. The detail can’t be beat! 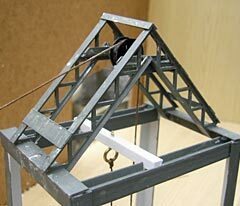 Simon also makes and sells a range of modeling supplies for this big scale under the trade name Modelearth Design. Thanks to Gerry Snelson for calling this layout to our attention!